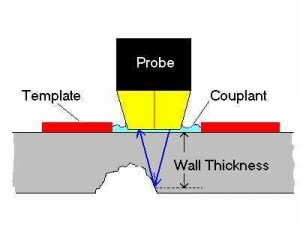 Wall thickness measurements available from Ultrasonic thickness (UT) gauging can be used to determine corrosion rates more accurately than corrosion coupons when measurements are made at permanently installed UT test templates. When test templates are installed, actual wall loss is measured from the same site over time, allowing for more precise estimates of corrosion rates that approximate real-time rates. Test templates are an effective way to determine the remaining useful life (RUL) of system piping without the need for destructive analysis. Ultrasonic testing can be performed without the need to drain the system. It can cover a large portion of a piping system economically and can be used to determine the presence and extent of localized corrosion. However, UT does not provide information regarding the presence or composition of waterside deposits. Waterside deposits are best evaluated by visual inspection and destructive pipe sample analysis.